^ "Top 10 Vehicles for Towing" Edmunds.com, retrieved on 2010-02-08. Archived August 31, 2009, at the Wayback Machine. ^ "Chrysler to Cut 1,825 Jobs on Early Plant Closure, Output Trim" Bloomberg, retrieved on 2009-10-23. Archived 2013-12-03 at the Wayback Machine. 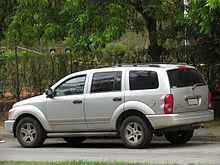 ^ "Dodge Durango - Seven Seat Charger"